You can take either the sleeper bus from 深圳 Shenzhen’s 羅湖 Lo Wu station, or, as I recommend, the express train from Lo Wu to Guangzhou. 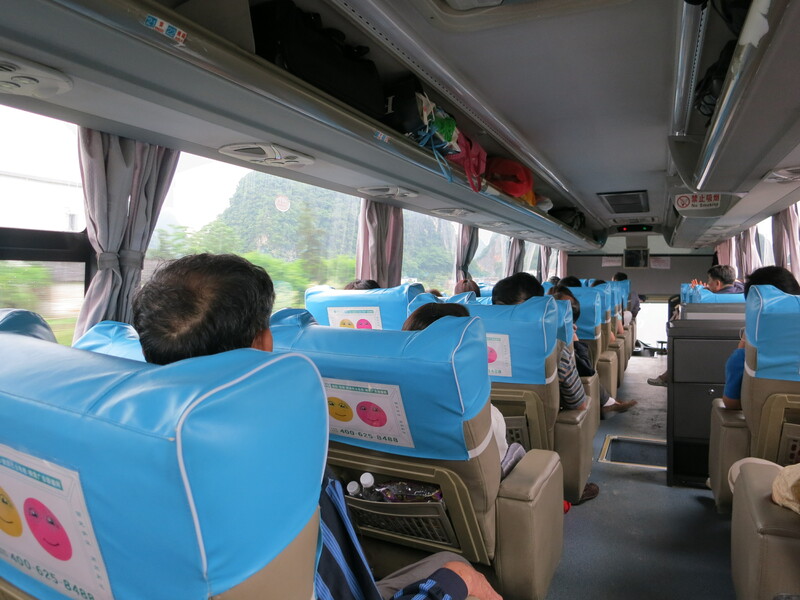 The sleeper bus costs about 260 Yuan and departs daily at 7:30pm and 8:30pm from the long distance bus station at Lo Wu. To get there, take a left as soon as you leave the border station and go up the escalators to the overpass. The building on the other side is the bus station. Buy your tickets directly from the ticket booth, or you will likely be scammed. It takes about 13h to get to Yangshuo and can be quite a bumpy ride on the small and hard sleeper beds. I recommend taking a train to Guangzhou, spending the night there and enjoy the landscape around you slowly changing the day after in a comfortable bus. Getting to Guangzhou is fairly easy, as there are trains departing roughly every 15 minutes. They cost 80 Yuan, are modern and on time and take you to Guangzhou East Railway station, from where you can easily get to a Hotel or Hostel by subway or taxi. Yangshuo is about 420km away from Guangzhou, with various buses making the trip on the newly constructed highway in about 6h. The long distance bus station is right next to the central train station. There are frequent buses going through Yangshuo to Guilin. The 9:10am bus costs about 210 Yuan but has extremely spacious seats. By the time you arrive in Yangshuo, you will have plenty of time left to explore the town, get yourself a good meal (try Beer Fish, either carp or catfish cooked in beer sauce) and relax on one of the town’s roof top bars, from where you have a great view over the 漓江 Li River and the mountains. The hostel Monkey Jane’s Guesthouse has such a roof top bar, which is also accessible to non guests until midnight. 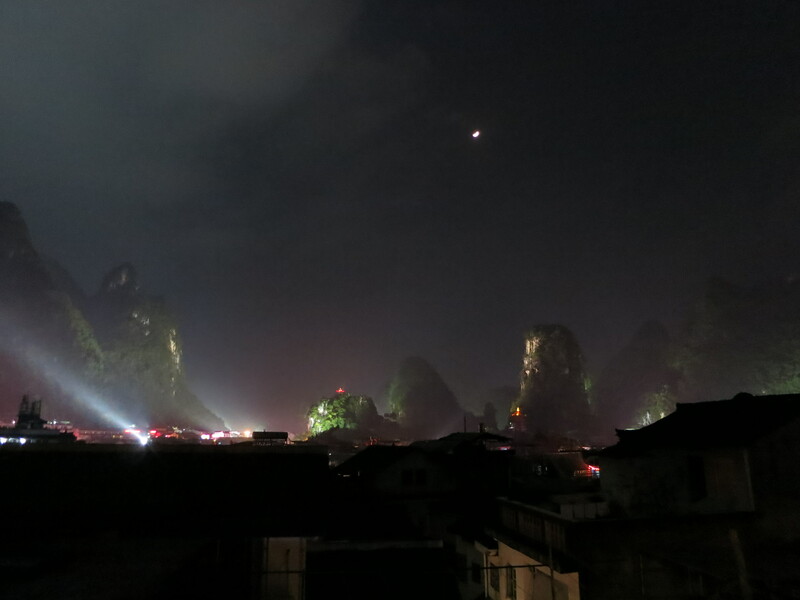 The noise will probably make you not want to stay there, so I recommend Yangshuo 11, which also has a nice roof top, though there is no bar on it. The are around Yangshuo provides many opportunities for hiking, walking, climbing or more adventurous activities like rafting. It rains a lot in the area, which although it adds to the flair of the place can lead to disappointment. Consider to explore some caves or prepare yourself. Cycling too can be a great option to explore the area, with many cheap cycling rental shops in town. 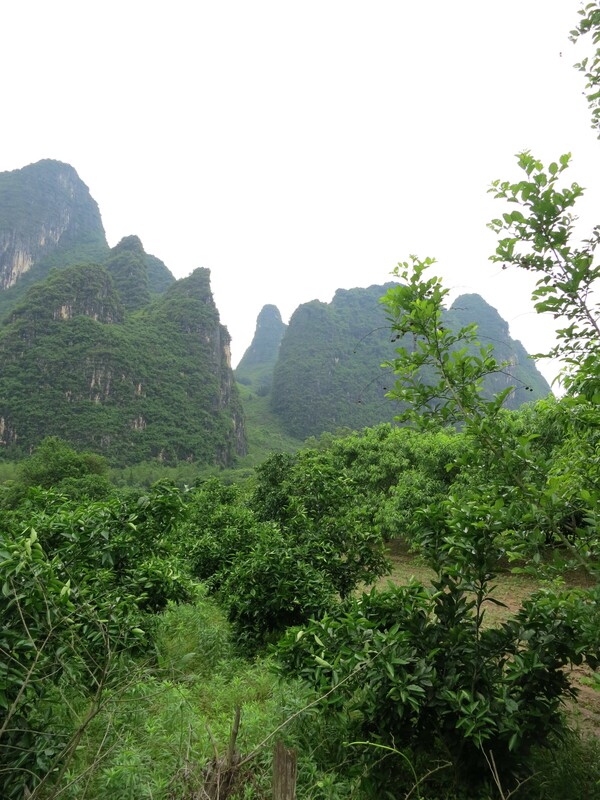 The Li River is a must see in the area. Many tours (~300 Yuan) include a scenic bamboo raft, which can also be individually booked at the ferry terminal at Yangdi (~180 Yuan). I do not recommend doing this if you are in doubt if you want to spend that kind of money. Consider taking a bus to Xingping from Yangshuo (~10 Yuan) and walk upstream from there. You will reach the famnous scenic spots by feet and are free to walk upstream. Feel free to dive into the orange groves along the villages! Consider dropping taking your stuff in the morning and dropping it in Xingping for the day (local hostels) for a small fee. Then in the evening, take a bus to Guilin from there. Many hostels in Guilin (like the Green Forest Hostel) offer tours to the 500 year old Longsheng Rice Terraces which you might consider. Given that they include transportation, entrance fee (80 Yuen alone) and some performances you might not end up spending that much more than if you organize it yourself. You should however organize the trip yourself if you plan to spend a fair amount of time hiking. Tours usually just take you to one village, show you around and do not allow you more time exploring on your own than it takes to climb one peak and come back. To get there, go to the regional bus station in Guilin. It is not the large intercity bus station downtown, but rather a few minutes away. To get there, take bus 91 (for example from directly next to the intercity bus station) south. The bus will make one turn to the right and one to the left before you see the bus station on your right side. It is next to the LiQ brewey. The bus to the city of Longsheng (22 Yuan) makes a stop next to the park, from where you can take another bus to the villages (10 Yuan). Get there early and allow yourself to cross over the peaks from village to village! On the way back consider asking young locals to share a ride with you, as everyone is likely to go back to Guilin. Day 5 – Going back. You again will have the option to either take a sleeper bus or the day bus. There are also daily night trains, but they are slow and uncomfortable and probably only an option for train enthusiasts. Take the same route back, with buses departing hourly from the intercity bus station in Guilin to Guangzhou. From the place of arrival in Guangzhou you can take the train back to Shenzen, though make sure to find the Shenzhen-only ticket boots first! And remember that you need your passport to buy train tickets! The Li River near where the picture for the 20 Yuen note is taken from. West Street on a saturday night, shortly before the May 1st celebrations.